A mysterious killer torments a group of social media-obsessed 12-year-olds having a sleepover in a luxury mansion. Art dealer Harry Cox and his mistress Lisa are murdered after having a rendezvous along a road near his lavish mansion. Middle-class mother Emma drops off her troubled daughter Sam at the Cox mansion for a sleepover with Sam’s snobbish friend Sofia. Upon entering, Sam overhears Sofia and her friends Ava, Francesca, and Georgie discussing Sam disparagingly. Plastic surgeon Dr. Michael White admonishes his daughter Cat for getting in trouble at school for bullying. Dr. White then drives Cat to Sofia’s party. Inside the house, Cat overhears a conversation between Sofia’s mother Alex and Alex’s friend Jamie. Jamie recounts how the Cox home once belonged to Ray Jamison, an artist friend of Andy Warhol’s who killed six partygoers in a psychotic rage before mysteriously disappearing. Cat retells this tale to Sofia and the others as the girls begin their party by trying on designer dresses and bullying each other. Alex lends jewelry to the girls before leaving them alone in the house. Sofia kicks out Cat for teasing Georgie too viciously about her weight. Cat runs crying into the snowy forest outside and leaves a frantic call on her father’s voicemail. Georgie dares everyone to lock up their phones as a challenge to stay away from social media. Sofia throws away the key. The girls drink vodka, share personal histories, dance, and swim throughout the evening. Dr. White angrily barges in looking for his daughter. As Dr. White confronts the girls, Sam goes outside in search of Cat. Sam finds Harry Cox’s car with blood smeared on the windshield. Dr. White leaves after threatening the girls. Sam returns and tells the others about the bloody car, but Sofia refuses to believe it is her father’s Ferrari. Sofia insults Sam and tells her to leave. The girls realize that Ava is missing. Upset at Georgie and Francesca’s ongoing insults, Sofia leaves the house to search for Cat. Dr. White finds Alex in town and angrily confronts her over leaving the girls alone and losing track of his daughter. Sam returns to the main room to make amends with Francesca and Georgie, but soon leaves again. Dr. White searches the woods for Cat. Sofia finds her father’s body inside the bloody car. She tries calling Alex from Harry’s phone, but presuming it is her cheating husband, Alex refuses to listen. Sam finds Ava dead in the basement. The killer attacks her, but Sam escapes outside and regroups with Sofia in the forest. Sam returns to the house to find a phone. The killer unsuccessfully tries drowning Sam in the pool before slitting Georgie’s throat and stabbing Francesca to death outside. Dr. White arrives at the house. As he and Sam survey the carnage, the killer removes her mask outside the window and is revealed to be Cat. Thinking Dr. White is the killer, Sofia enters the room with a gun and shoots him. Sam recovers Sofia’s weapon and confronts Cat outside. The two of them hold each other at gunpoint. Alex returns home in time to witness Cat turning the gun on herself to commit suicide. Using the go-to social media designation for all things horror to name a movie is a double-edged proposition. On one hand, a certain amount of awareness is assured just from accidental pinging of the handle and a perceived timeliness of its usage. On the other, the risk exists of dating the film to a fluid trend and losing identity when an overwhelming torrent of unrelated traffic retakes its title, leaving the movie to become a forgotten footnote. In the case of “#Horror,” that latter option is preferable. The adults in “#Horror” are the plastic surgeon, art dealer, and Connecticut socialite types who overdress for a day of ennui in museum-sized mansions where violin music echoes off art-filled walls. The young girls are social media mavens whose hands are inseparable from cellphones used to snap selfies tagged with hateful hashtags while trying on stoles and catwalking designer dresses. That leaves the 99% with no one to give two shakes about as spoiled snobs have throats slit and stomachs stabbed by a masked killer, someone doing what viewers would do themselves anyway after spending 90 minutes with such an insufferable lot. To watch “#Horror” is to have the passive experience of seeing awful people regard each other cruelly, with affluent boredom as an explanation for bad behavior. “#Horror” is a dark social satire not truly aiming to be traditional entertainment for pure-blooded horror/thriller fans. But its commentary is too cold to connect as meaningful, and the intent is too scattered to come together as a satisfying story. With a deep background as an actress, writer/director Tara Subkoff entrenches her movie in an experimental indie aesthetic that reads as a feet-wetter for a first-time filmmaker. Far and away, the focus is in exploring performances artistically with considerably less concern for structuring a cohesive narrative. Notable actors including Balthazar Getty, Natasha Lyonne, and Taryn Manning appear in single scenes, with Lyonne and Manning easily excisable altogether from the final cut. The feel of these disposable inclusions is one of called-in favors for the sake of hanging out with friends on set, with an additional bonus of dropping one more name into the credits. The meat of the movie becomes a collection of moments failing to flow into one another. There is honesty in the acting as Subkoff has the girls wear masks and dance, synchronize swim, swap stories about troubled families, etc. The problem is such scenes infrequently contribute to a bigger picture of generating interest in characterizations or advancing the plot’s purpose. Established staging then has late inning trouble keeping up with the path of the plotting. The script jumps hurdles cheaply by cheating details to a point where the board no longer cares to recognize pieces that were previously positioned. Early on, the girls challenge themselves to avoid electronic addictions by locking up their phones and throwing away the key. But when the last act requires the killer to torment the tweens with social media evidence of bloody murder, lo and behold, one girl finds a mobile device lying within arm’s reach on the floor. A device that quickly loses all remaining battery life before a “help us!” message has a chance to be sent, too. Another girl is attacked in the basement, but narrowly escapes. The story needs her to reunite with a second wayward girl, however. So instead of going back upstairs to the two girls she just left, Girl A runs into the dark and snowy forest outside where she serendipitously stumbles across Girl B, who apparently no longer remembers the way back to her own house. Those are but two examples of ways characters are conjured and items suddenly appear on an as needed basis. If I wanted to pick nits, I’d also point out that the movie takes place on Friday, December 10th. That means the year could only be 2010 at the latest, which is not exactly a peak saturation point for the social trends and cyberbullying problem the story tries to satirize. 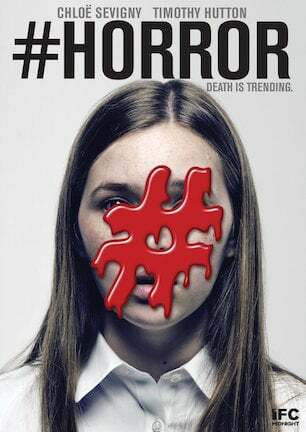 “#Horror” is reportedly “inspired by actual events.” According to an interview with Tara Subkoff for Elle, those “actual events” appear limited to a secondhand story of a friend’s daughter changing schools because of bullying, and nothing nearly as insidious as serial murder. A truer story is that “#Horror” is an unfocused movie with no defined audience in mind. It starts from a noble theme of “contemporary bullying is bad,” yet its tone isn’t tuned to know what that means as a movie. Exemplifying this is a highly distracting framing device of animated clown vomit repeatedly popping up with emojis, “like” number counters, text bubbles, and video game overlays. This stylized strategy of throwing trends at a wall hoping something will stick is simply not a smart plan for creating compelling cinematic content. January 11, 2016 by Ian Sedensky.